Wireless coverage is no longer a premium amenity. It is an expected necessity. Hotels, convention centers, resorts, and casinos are social hubs where tens of thousands of people gather together at one time, with most people carrying a mobile device. Vacationers and business travelers alike rely on their mobile devices both in public spaces such as lobbies and restaurants as well as in their guest rooms. 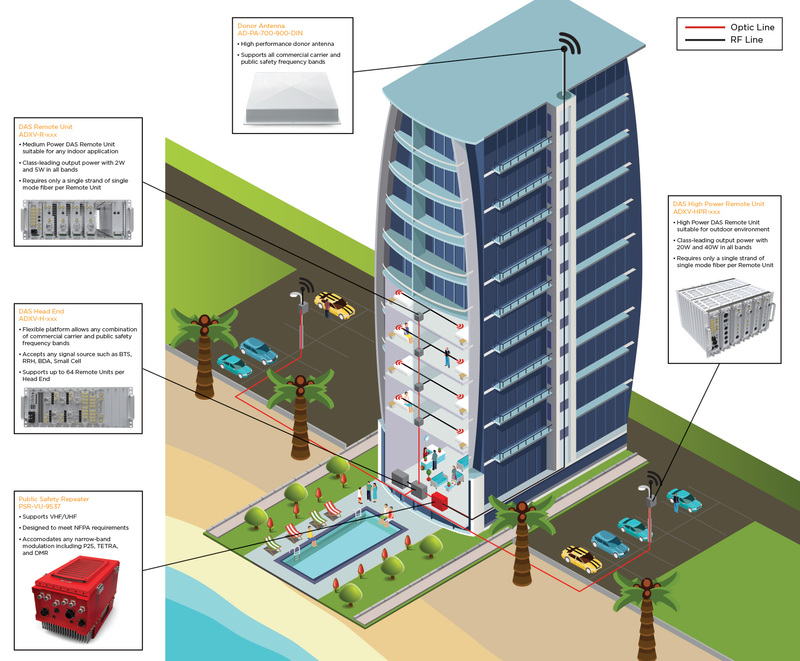 Providing ubiquitous wireless service in these spaces can present a challenge as hotels need to accommodate guests no matter their service provider as well as be able to support a large volume of data usage. ADRF offers the industry’s simplest, most intuitive Distributed Antenna System (DAS) to enable the fastest, easiest, most cost effective deployment for any hospitality venue. Our DAS has the reliability of a carrier grade solution. It is trusted by Tier 1 Wireless Service Providers (WSP) and is fully licensed as Industrial class by the FCC. The ultra-modularity of our DAS allows you to Pay-As-You-Grow in which critical areas can be covered first to maximize cost efficiency and speed of deployment while still accommodating future additions in coverage scope as well as WSP or frequency bands. ADRF’s comprehensive portfolio of industry leading DAS solutions are ideal to enable hotel administrators and staff to deliver enhanced guest experience in any hotel, resort, casino, or convention center. Total Area: 331,000 Sq. Ft.
Total Area: 339,000 Sq. Ft.
Total Area: 106,000 Sq. Ft.
Total Area: 600,000 Sq. Ft.
Total Area: 235,200 sq. ft.
Total Area: 355,000 sq. ft. The W Minneapolis – The Foshay is a historic 32-story art deco hotel known for its luxurious interior and high quality service. However, guests were frustrated with the lack of cellular coverage in certain areas of the hotel. The poor coverage was a result of the steel, concrete and limestone of the hotel’s structure blocking RF signals. ADRF’s unique ADX DAS solution kept the building’s original architecture intact while providing reliable service to all hotel rooms, lobby, and dining areas.